Just imagine the incredible energy of millions of voices around the world singing with the same harmonious and peaceful intention. Here is an incredible story of how the One Day One Choir chooses the harmonious and uniting power of singing together as a step forward to peace and unity. Singing has the power to make us feel calmer, happier and uplifted as well as having a direct and measurable impact on our mental and physical well-being. Singing together has long been a powerful and positive part of bringing and holding communities together and uniting them in a social and healing way. It’s even been shown scientifically to bond us with one another more quickly than any other group activity. 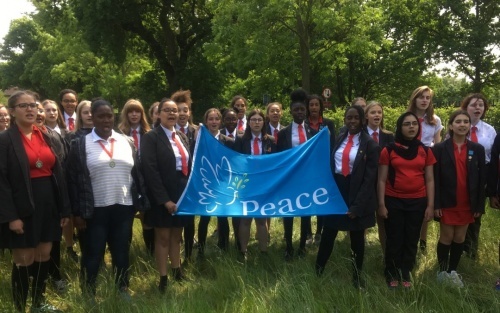 Incredibly, since starting in 2014, One Day One Choir has encouraged more than a million people around the world to sing for peace and unity each year on Peace Day, from world class ensembles such as the London Philharmonic Choir, Tenebrae and The Boys Choir of Kenya, to school, community, faith, workplace and local choirs in more than 70 countries. It’s really easy to become part of One Day One Choir. Literally all you need to do is get together with a few (or lots of) people in your community, sing something for peace, and add your voice to the ever growing global choir for peace by signing up at their website. Anyone in any kind, size or age of group can take part; from schools and symphony choirs to community, faith, friend, social, fun or work place groups. You can sing wherever suits you and at any time during the day so you don’t need to find a special venue – There have been groups singing in hotels, hospitals, parks, cathedrals, work places, playgrounds, faith buildings, on the street, in concert halls, care-homes, stations, prisons, shopping malls, public squares – even in their cars! One school literally sang from their rooftop "so that everyone (in Chicago) could hear them." Who gives us the right to destroy? A worldwide desire for peace! Let us sing in harmony Together as One. So why should we all think the same? This is the power of song!